It’s called Genealogy NOW! 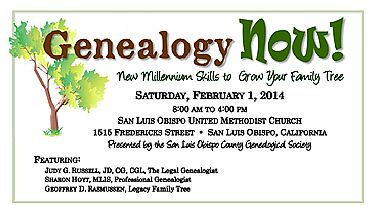 – an all-day seminar in San Luis Obispo, California, on February 1, 2014. But it really should be called Genealogy WOW! And it’s all in a place where (sez The Legal Genealogist from her still-frigid east coast base) it’s warm. Genealogy NOW! is sponsored by the San Luis Obispo County Genealogical Society, and it’ll be held at the San Luis Obispo United Methodist Church. Onsite registration starts at 8 a.m. (and there will be snacks!) and the festivities get underway at 9 a.m.
Preregistration has its benefits: although everybody who attends will get the syllabus, anybody who preregisters — even if you can’t make it that day — will get a copy of the syllabus in PDF format. There are some great speakers in the line-up: Sharon Hoyt, my friend and classmaste from the National Institute of Genealogical Research at the National Archives some years ago; Geoff Rasmussen of Legacy Family Tree who does such a great job running its free webinar series; and… and… and… who’s the third speaker? For more information, you can visit http://slocgs.org/ where you’ll find links to the schedule and the mail-in registration form and the speaker biographies too. It’s a great way to begin to make good on that resolution to learn more about your family. So come on out and join us! I saw that you will be speaking on using court records in your research. I am unable to get to any of the events, however.. well, maybe Long Island, but.. Catholic Family Services told my mother and me about a police record for HER mother in Hartford, CT in 1930 (I think public drunkenness). How would I go about finding that record? I’d love to know who was with her- that info could solve a BIG problem! Thanks!